As an online preview of a special issue of SubStance devoted to David Mitchell’s fiction, we are posting a review-essay of his book by Paul Harris and an excerpt of an interview with the author. The interview will appear in the special issue in spring 2015. David Mitchell’s The Bone Clocks, the latest iteration of his fractal imagination, follows a central character’s life through six decades in six sections that simultaneously succeed as stand-alone stories. Protagonist Holly Sykes narrates the first and final chapters; in the middle ones, her life is seen prismatically through the lenses of others who cross her path: Cambridge student Hugo Lamb, war journalist Ed Brubeck, bad-boy author Crispin Hershey, and Horologist Marinus. Navigating this narrative proves to be a rollicking ride: the plot is a propulsive page-turner, picking up momentum as it goes; the narrative is kaleidoscopic-episodic, unfolding in a series of juxtapositions and sometimes sudden shifts; the style is protean, skipping skillfully among different rhetorical registers, allusive layers, and literary genres. 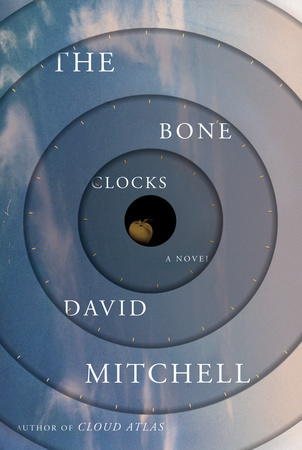 At the same time, The Bone Clocks is a tightly woven text that recursively loops through Mitchell’s previous books and ultimately interlaces all his books into an intricate, sprawling intertext. Returning Mitchell readers will encounter familiar faces (Lamb, Marinus), and recognize allusions to his other books (“The Voorman Problem,” a story attributed to Hershey, is from Number9Dream; the “symmetrical structure” of Hershey’s novel Dessicated Embryos can be read as an allusion to Cloud Atlas, and there’s even a comical reference to the movie). Back-stories in The Bone Clocks turn into/out of back-stories to episodes/elements from previous novels (Magistrate Shiroyama’s killing Abbot Enomoto in The Thousand Autumns of Jacob de Zoet; the Prescients in Cloud Atlas).